A former Silicon Valley executive tasked with helping shape the digital transformation in Queensland says the "next big thing" can be dreamt up in Brisbane. 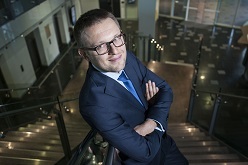 Dr Marek Kowalkiewicz has been named the PwC Chair in Digital Economy - a partnership between QUT's Business School and Science and Engineering Faculty, PwC, the Queensland Government and Brisbane Marketing. Dr Kowalkiewicz will hold the Australian-first Chair, based at QUT's Gardens Point campus, after two years in Silicon Valley as senior director of products and innovation for multinational software corporation SAP. He said Brisbane and Australia should not try to copy "unique" Silicon Valley, but could learn valuable lessons from its culture of collaboration. "In Silicon Valley collaboration and innovation are natural things, it is part of the fabric of the place," Dr Kowalkiewicz said. "You go out to get a coffee and at the next table you have people talking about their start-up. And perhaps you overhear and realise you have a skill that can help them. People deliberately go to cafes and public places to have these open discussions. It's about encouraging collaboration. "You are in the very centre of where things are happening that will change the world, which is very exciting, but it has its downsides too. It's easier to get investment for tech start-ups in Silicon Valley because so many investors made money from tech, but this can make those people involved in start-ups distracted and, sometimes, complacent. "Silicon Valley is a well-fertilized ground for innovation but Brisbane has people that are just as smart, with just as much creativity, and with their own innovative ideas. "I don't think I'll ever regret leaving Silicon Valley. I think the next big thing could be here." Dr Kowalkiewicz said the Chair would explore opportunities for the remodeling of key industries, research and learning in the face of unprecedented digital disruption. "It is our mission to help Australian businesses, governments and communities make sense of the massive changes happening now as a result of the digital economy," he said. "We see the outreach of the Chair as global. You cannot just build a solution these days and limit it to one market. "For example if you look at the surge in popularity of holiday home rental websites, it becomes something countries all across the world want to be involved in." Dr Kowalkiewicz said the chance to lead an ambitious research agenda to inform and influence the digital economy had driven his return to Brisbane, where he spent time as part of his PhD study. "My role is not only focused on research publications. I always want to help make a dent in the universe, and, even though it sounds cheesy, to find solutions that help change the world for the better," he said. "I believe QUT specifically is one of the very few universities which is really ready and able to impact the real world." Professor Michael Rosemann, Head of Information Systems at QUT, said Dr Kowalkiewicz had an impressive research track record. "He brings an international research perspective and applied industry perspective to the PwC Chair. His research record is impressive with over 60 published papers and 12 patents to his name," he said. "Marek was chosen from a formidable field of candidates. Digital is creating seismic shifts in business value creation, social networks, future jobs and our thinking so we need to be ready to capitalise on the opportunities this profound change will provide." Professor Rowena Barrett, head of the QUT School of Management, said: "Marek brings energy, practical experience and research insight to the role of PwC Chair in Digital Economy. "He has hit the ground running and is working hard to bring government, corporates, small business and the academic community together to collaborate on solving problems and creating opportunities in the digital economy." Digital Identity 3.0, a public event showcasing research, insights and industry collaborations focused on digital identity will take place on Monday, August 31 at PwC's Innovation Hub in Brisbane. The new PwC Chair in Digital Economy, Dr Marek Kowalkiewicz.